What does a producer do after his 1972 film about a sinking cruise ship is the highest-grossing film of the year? Why, he makes an even bigger film the following year, and this time sets everyone on fire! 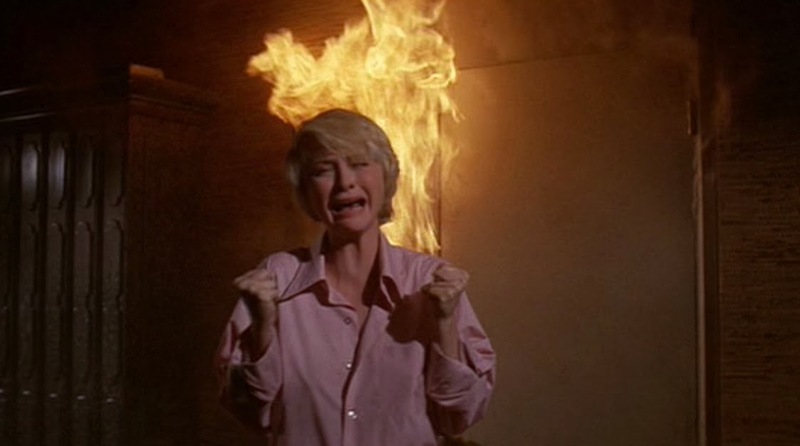 The Towering Inferno (1974) is problematic. On the one hand, The Towering Inferno is 138 stories of delicious, delicious cheese. On the other hand, The Towering Inferno manifests the problems that would sink nearly every disaster film that came after it. The Towering Inferno was inevitable. Oh, the humanity! Irwin Allen, basking in the glory of his based-on-a novel smash, The Poseidon Adventure, decided to up the ante and combine TWO novels -- The Tower by Richard Martin Stern and The Glass Inferno by Thomas Scortia and Frank Robinson -- yet manages to make a movie that is half as good. In the words of stand-up comedian John Mulaney, if The Poseidon Adventure is lobster, then The Towering Inferno is Skittles. The Plot In Exacting Detail: Famous architect and piercing-blue-eyes-haver Doug Roberts (Paul Newman) prepares for the grand opening of the new high-rise building he has designed for oily but charming builder James Duncan. Roger Simmons (Richard Chamberlin, who lacks only a moustache to twirl) is Duncan's weasel of a son-in-law and the electrical contractor on the project. Unbenownst to everyone but the audience, Simmons has cut corners on the electrical systems to save money. An electrical fire starts up on the 81st floor. Luckily, most of the rest of the cast is on the 135th floor at a party celebrating its grand opening, so they are safe, right? Security Head O.J. Simpson tries to evacuate the building, but he is ineffective -- and one of the reasons it is hard to watch this movie with a straight face. O.J. SIMPSON SAVING LIVES? Puh-leese. Building magnate Duncan is full of hubris and cheap scotch and refuses to evacuate the building. Duncan's hobby must be "watching extras die." Fire Chief and piercing-blue-eyes-haver Michael O'Halloran (Steve McQueen) arrives and wins the fight to evacuate the top floor because he has top billing. Extras are sent down on the express elevator until that blows up. Fred Astaire shows up for some easy nostalgia and to get nominated for Best Supporting Actor. Roberts saves an old woman, her grandson, and a kitten. A scenic elevator on the outside of the building is roped to a helicopter with predictable results. 1943 Best Actress Oscar winner Jennifer Jones shows up in time to fall out of the scenic elevator. Are you getting all of this down? God, but this movie is long. After exhausting all reasonable methods of squelching the fire, Newman and McQueen work together to devise the remaining cast members' last, best hope. Their scheme involves the "Deux Ex Inferno" of millions of gallons of water conveniently stored on the roof of the building. All hell breaks loose. Producer Allen ups the hubris by directing the second unit himself (the action sequences) and giving his own second unit (um, er... girlfriend, soon to be second wife) a part in the film. She is underwhelming, to say the least. 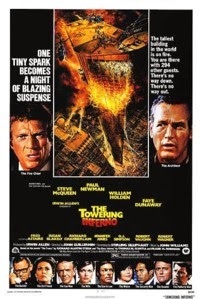 For fans of the genre -- which I am -- there is something irresistible about The Towering Inferno. As we discussed last week, it is tremendous fun watching Guys Who Know What They're Doing butting heads while they try to solve a massive problem. Newman and McQueen keep dreaming up more and more elaborate schemes to save these people... yet those very people, in their small-minded pettiness, thwart them at every turn. Newman and McQueen are the film's stars, sure, but they are also the only characters we like. Could it be, as it is in more conventional movies, that the entire conflagration exists only to bring the film's two most beautiful people together? Think of the film's iconic last line, as Newman says to McQueen, "Okay, I'm asking." One can imagine the line continuing, as the credits begin to roll, "...so what are you doing Friday night?" I'm presuming that the majority of the original theatrical audience showed up to see buildings and people on fire, not the metaphoric fires of romantic love, but that does not stop screenwriter Sterling Silliphant from overloading the production with unnecessary subplots and romantic intrigue. I am now naming this the "Everybody Gets A Girl!" syndrome, a condition from which Silliphant's earlier The Poseidon Adventure did not suffer. Paul Newman wants to quit the high stakes, laugh-in-the-face-of-danger life of a big city architect and run away to somewhere unspecified with his main squeeze, Faye Dunaway. Trouble is, she's some kind of magazine editor and has just been handed a hard-won promotion. William Holden's daughter, Susan Blakely, is having trouble at home with her n'er-do-well, lothario husband, Richard Chamberlin. Fred Astaire tries to bilk Jennifer Jones out of her riches but winds up falling in love with her instead. Robert Wagner is having an affair with his secretary. O.J. Simpson suspects his wife of having an affair with a local waiter and murders both of them with a knife. Okay, that last part didn't really happen (IN THE MOVIE), but you get the idea. None of this has anything whatsoever to do with the fire. Maybe the reason we like Steve McQueen so much is that he is the only one onscreen who's single? Adding more plot never improves a film. Most of us watch movies to see human behavior and gain insights into our own lives, not witness an interminable narrative puppet show. Look at the latest film by the Coen Brothers, Inside Llewyn Davis. The plot, as such, can be summarized in three sentences, but that is not the appeal of the film. The film captures human behavior and a specific moment in time with such breathtaking clarity that art is realized and the audience goes home happy. Irwin Allen, on the other hand, "improves" his film by simply adding another hour of mechanations that lead to things and people catching on fire. The theatrical print of The Towering Inferno is just shy of three hours; the expanded television version is EVEN LONGER STILL. TANGENT: Watching the film again, one is reminded of just how many of these actors must have at one time vied for the same parts. One longs for a scene that I will name "A Battle of the Oily But Charming," in which William Holden, Richard Chamberlin, Robert Wagner, and Robert Vaughn compete to see who is the biggest snake in the grass. Vaughn wins by stealing Chamberlin and Wagner's blowdryer. Holden falls off his barstool. The special effects are impressive, but slow. To squeeze every dollar of value out of every minute of pyrotechnics, Allen (as second-unit director) usually resorts to slow motion to emphasize all of the "flaming characters" and their obvious pain. Problem is, the same slow motion usually reveals stuntmen in over-sized, seventies-era burn suits. When Robert Wagner is forced to run across his flaming office using nothing but a bath towel for protection, his run for life may just be longer than the entire climax of the film. There's the rub. 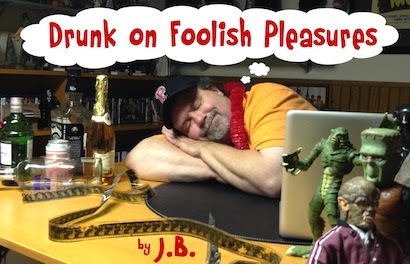 John Landis famously said that the problem with special effects shots is that when they turn out good, directors want to use every foot of film, and that is anathema to editing a tightly paced film. So many films simply stop dead for bravura special effects moments, and The Towering Inferno certainly errs in this department. On a darker note, this film like most disaster films, says a lot about human nature, not all of it roses and sunshine. I love the many impressive scenes of people scurrying like rats to save themselves. I sit and wonder if I would wait my turn in the helicopter basket or, like Richard Chamberlin, push everyone out of my way (he even throws a U.S. Senator to his death) just to save my own skin. I burn easily. I wear a medical alert bracelet inscribed FLAMMABLE. The Towering Inferno was nominated for eight Oscars (including Best Picture) and won three (not Best Picture). People used to consider this kind of thing entertainment. The Poseidon Adventure won its lone Oscar for Best Song -- "The Morning After," sung by Maureen McGovern. 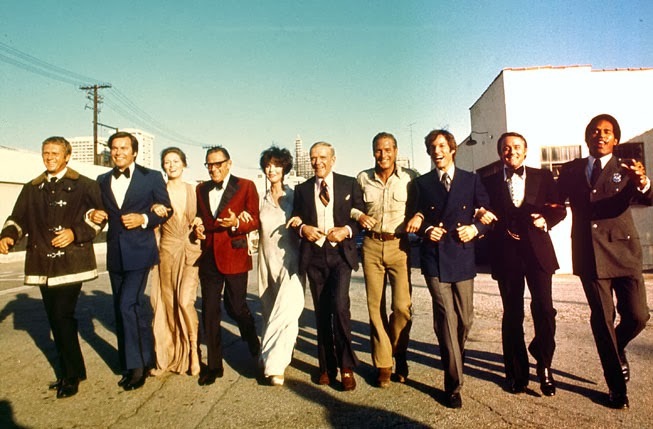 The Towering Inferno won Best Song with "We May Never Love This Way Again ('Cause We Are On Fire)" also sung by Maureen McGovern; it also garnered Best Cinematography and Best Film Editing. On The Bright Side: The Towering Inferno was a monster success, the highest grossing film of 1974. Given the number of people who saw it upon its original release, could some of them have walked away with some useful information to use if they were ever in a fire? The film is dedicated to firefighters everywhere, but I wonder if this film may have actually saved lives. Oh, The Towering Inferno also teaches us not to be a selfish, backstabbing pricks, or philandering rogues, or anyone not having piercing blue eyes. Lesson learned. A disaster film that takes place on a roller coaster? Now that I've got to see. On the off chance you see this (don't know if you're on twitter), ROLLERCOASTER is on TCM at 12:15 EST tonight. You can read about it here in about two weeks! I've always been a fan of disaster movies, and The Towering Inferno is probably my favorite. The opening music by John Williams might be his most underrated work (as is the closing theme, called "An Architect's Dream"). There's no doubt that it is LONG, though. There's one sequence that always brings the movie to a screeching halt for me - when Newman, Jones, and the 2 damn kids have to shimmy down a creaking handrail after several floors of stairs blow out. I usually go make popcorn at that point. Can't wait for the Rollercoaster review! Put a good word in for Lalo Schifrin's fine score, if you would. Good review but I think the Towering Inferno is a masterpiece. It's perfect film making on a grand, high scale. It got nominated for best picture but people that view it mostly rip the film. Its gotten a bad rap over the years. I'm saying it right now: * * * * Stars.